Was the 2013 Pakistani General Election Stolen? Over the course of the last two years, the 2013 general elections that saw Nawaz Sharif get elected as the country’s prime minister have slowly and steadily become the most controversial in the nation’s short democratic history. Cries of a rigged election were heard just as soon as the results started reeling in. What people thought was merely a rhetoric, a feeble exercise that losing politicians often fumble through, turned into a dramatic revolution (of sorts). Turns out, the reality was far more explosive than anyone had dreamed. Pakistan Tehreek-e-Insaf (PTI) and Pakistan Awami Tehreek (PAT) took to the streets for roughly four months in protest of what they considered a flawed system stemming from mass rigging in the 2013 elections. 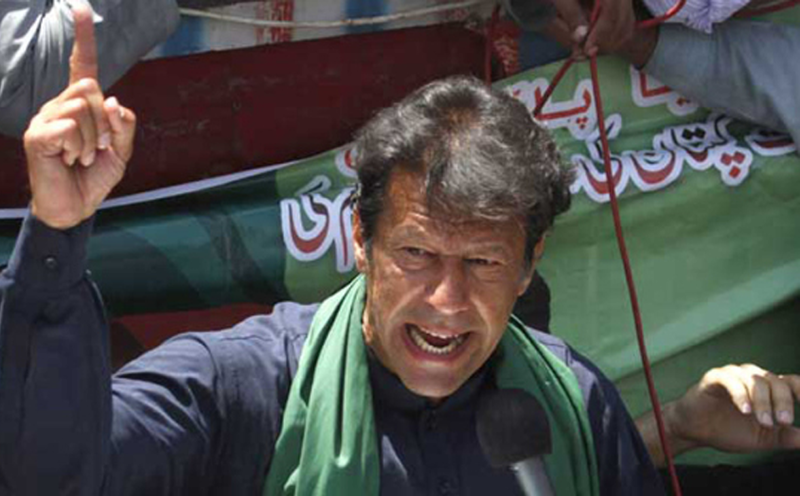 Throughout the entirety of the sit-in protest (dubbed the Azadi March), the news media fixated itself on the dramatic accusations that the PTI chief Imran Khan would occasionally hurl at the sitting government. Khan accused the Sharif government of being a product of a rigged election and therefore void of any legitimacy. Khan often climbed atop a make-shift stage housed near the parliament to address large throngs of people. He talked of the many forms of electoral fraud that he’d been told of by the people around him and masked the retelling of these thrilling tales in a manner that made it appetising for the local media to gobble up on. Such was the tale of “Pentees Puncture” (35 punctures) which put the former Punjab caretaker chief minister, Najam Sethi, in deep waters with the press. Pointing fingers led Khan awry as he fumbled deep into accounts of rigging and corruption leveled against his rivals. His rivals, on the other hand, call his tales ‘cunningly fabricated’. It was with these outlandish claims that Khan’s aim gradually veered away from a desire to probe actual documentary evidence and facts, and landed on compiling baseless allegations against his political competitors to drum up controversy and conspiracy. Khan’s advisers thought it would be beneficial to target political heavy-weights in the sitting government if the parties in power refused to listen to Khan’s demands – chiefly amongst which was the demand to see Sharif resign as the prime minister. And so it passed that the PML-N kept refusing Khan’s demands and, as adamant as ever, Khan pronounced and leveled his blames at Sharif and his party. But where did it get Khan? Sure, it did grant him the audience of a judicial commission that he had asked for – a supreme body of judiciary that was asked to probe various evidence against the legitimacy of the election. But since Khan’s audacious tales of electoral fraud were the zenith of the media in the days the commission was formed, the judicial board started therein. One after the other, Khan’s loud claims got refuted and thrown out of the courts. 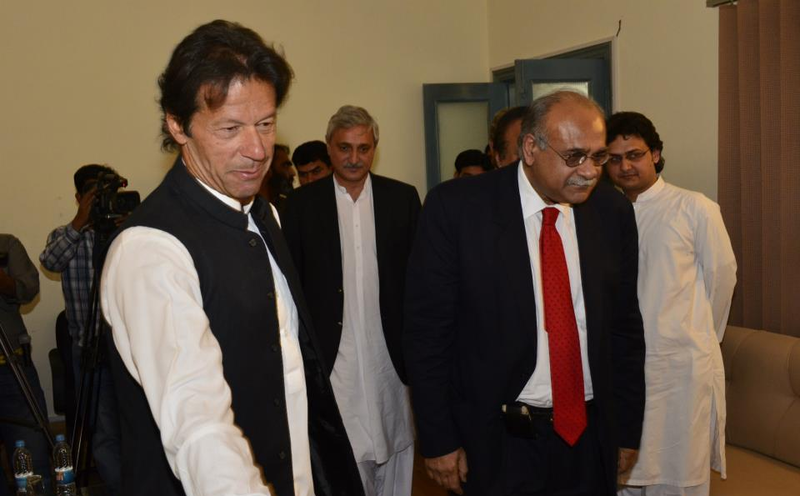 Khan (front, left) and Sethi (2nd from right) were at loggerheads with the whole episode regarding “Pentees Puncture”, but Sethi eventually had the last word. For a moment, even Najam Sethi got the satisfaction of writing in his paper, The Friday Times, that Khan had merely conjured up the whole “Pentees Puncture” episode. Sethi named Ejaz Hussain, former adviser to Chaudhary Pervaiz Elahi, as the ‘maverick’ who ‘cunningly fabricated’ the whole fiasco. With the recent political upset in the Khyber Pakthunkhwa local body elections, Khan badly needed a saving grace for himself and his followers – and he recently had one. On May 27, the judicial commission, headed by chief justice Nasirul Mulk, ordered for the sealed vote bags to be opened in order to obtain the records of how the ballot papers had been used. What came out of the bags was most astonishing. After scrutinising about 44,339 polling stations for 169 National Assembly (NA) seats, vote bags for around 14,641 constituencies were found to be without Form 15. This, by far, is the best evidence of massive irregularities in the past election. Media pundits have voiced concern that should Khan have focused on the issues of missing forms 14 and 15, he’d have a stronger hold on success coming out of his Azadi campaign. Nevertheless, this issue has already started stirring the debate back into PTI’s forte. At least, it is starting to become apparent how a whole general election was systematically stolen. And, for now, Khan can heave a sigh of relief. Next What are Forms 14 and 15?